Asutype is a smart Operating System-level real-time spell check and speed typing software that works automatically with your keyboard to increase your typing accuracy and productivity: it learns and adapts itself to your keyboard habits, spell checks and automatically corrects mistakes as you type, automates difficult and repetitive typing tasks, and applies several other original and innovative solutions to prevent you from making unwanted typos, increasing the speed and accuracy of your typing. While running, Asutype is continuously watching your typing in all applications. If the mistake is well recognized because you have made it before, Asutype will correct it immediately and automatically like it had never happened. If the mistake is unrecognized because this is the first time you have made it, Asutype will flag it, keep track of it and learn it so it can be fixed the next time you make it. By learning and adapting to your own typing pattern, Asutype becomes your own personalized typing assistant who knows how to correct your mistakes automatically to save you time and effort. This is possible because you do not need to stop typing and go back to correct mistakes yourself. Type "tyvm" to expand to "thank you very much" - type 4 keystrokes instead of 19 keystrokes, you'll save 79%! Type "utcc" to get "under the current circumstances" - type 4 keystrokes instead of 31, you'll save 87%! By using text abbreviations (or text shortcuts), your typing will be easier and faster. Asutype comes with hundreds of most commonly used phrases already shortened, and you can add unlimited new phrases of your own! Because Asutype works with your keyboard, it works all the time and everywhere – when you are emailing, chatting, writing a report or essay, participating in a forum, blogging or typing something else. By working at Operating System-level, Asutype gives you a unique and consistent software that works the same way with every application and prevents you from making annoying typos, speeds up your typing, saves you effort and makes more efficient use of your time. With a medical spelling dictionary of 62,484 entries and a fast text expander, Asutype will save you at least 30% of typing and make sure everything you type is accurate. It also works with a variety of commonly used word processors and medical systems. With its advanced macros, Asutype allows you to create sophisticated text shortcuts to enter patient information into your EMR/EHR system that adheres to your standards and cuts down the time spent filling free-form text. The parameterized and multi-clipboard supported text shortcuts let you create and maintain all sorts of canned texts and use them to answer repetitive questions quickly and easily. The on-the-fly spell check engine makes sure everything you type is correct -- even in live support -- improving your overall quality of customer service. 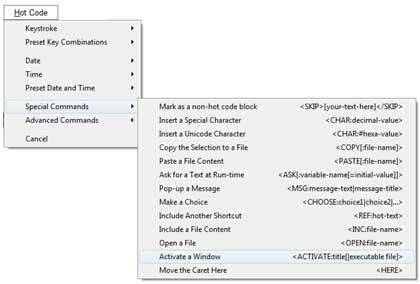 Asutype supports Unicode and can work with several languages simultaneously. You can use its flexible auto-correction feature to enter characters that are not directly available on your keyboard. You can also use its powerful text expansion to store and reuse commonly translated phrases quickly and naturally. 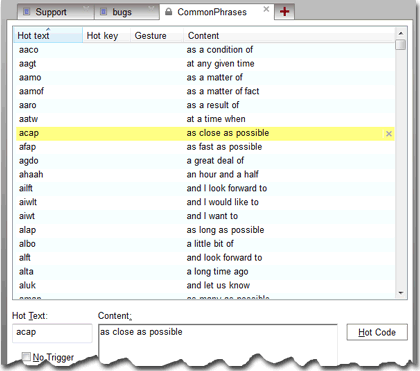 Asutype's on-the-fly spell check engine makes sure everything you type is correct. The hot key supported shortcuts and multiple clipboards help you cut, copy, paste and edit documents quickly and easily. You can store and reuse your notes, excerpts or boilerplate texts easily and save time, too. 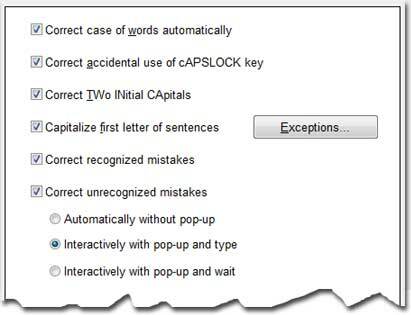 The on-the-fly spell check engine is un-intrusive and will make sure what you type is accurate even if you accidentally hit the wrong key. The super-powered on-the-fly spell check engine takes care of your typing and makes sure it is mistake-free everywhere and all the time. Therefore typing mistakes no longer slip into your writing unnoticed. You can also use the quick and easy text expansion to retype your signature or frequent texts. Whether you are a hunt-and-peck typist or a touch-typing power user, Asutype will minimize your mistakes, speed up your typing, save you effort and make more efficient use of your time. You'll be happy - we guarantee it!